Say Nothing, Act Casual: Apple? Pear? Fruit Salad? 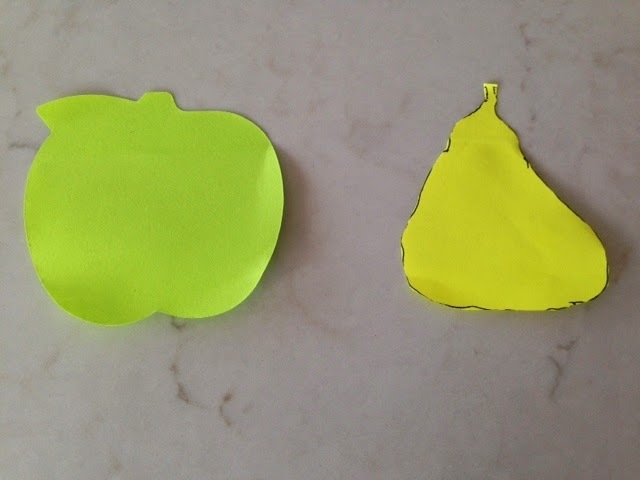 I had an apple sticky note. But I had to draw the pear. Sorry. On the weekend. I realised jeans season is approaching and flowy, sin disguising sundress season is about to end. I wondered if I could even do my jeans up. I decided enough was enough. Enormous indeed were my decisions. No more family bags of Maltesers were to enter the house. Ever again. Except when they're 2 for $7 because that really is a bargain. No more family bags of M&Ms were to enter the house either. Nor share packs of KitKats. Except, as above, if the price was so good, it would be a travesty to ignore it. After dinner each night I was to have a small sweet eg. 2-3 pieces Cadbury or 1 x diet mouse thingo. After that, if desperate, a cup of tea. No pre dinner cashew nuts. No no no. No finishing off kids meals. No no no no NO. After making this decision. I went onto the Michelle Bridges site for the 450, 000, 000th time. I toyed around with the Join My Team Now! button, or whatever it says, Be Your Best Self! or Start Your Fitness Journey! I didn't press it. She wants me to exercise 6 times a week while eating hardly anything. And what at the end of 12 weeks? Is exercising 6 times a week my future? Eating hardly anything my plan for life? Not likely. So within another 12 weeks after that I'll just be back to normal. I like to keep my fat nice and close, around my belly. This is (according to some expert, somewhere, or maybe many experts all over the world) a very very bad place to keep it. I should, if I'm going to carry fat, make sure it's on my hips and thighs, or my bum. This is (apparently) a much better place to keep it because it's further away from my heart. I am not sure all those lovely ladies with extra fat on their hips, bum and thighs would agree with this. And in any case, fat goes wherever it wants. In my case, it fancies hanging around on my belly. I have a close girlfriend who has a lovely flat belly, but her thighs and hips drive her mad. In fact, I have several girlfriend like this. If we are to resort to fruit comparisons, they are the beautiful pear. My pear shaped friend laments that when she does get a grip on herself and exercises and eats carefully, the LAST place to lose the fat are her hips, thighs and bum. Her face goes gaunt, her breasts start shrinking (gah!) but the other trouble spots remain troublesome. To continue the charming fruit analogy, I am an apple. This results in silly stick legs, topped by a round, comfortable, squishy middle. When I am careful with my food and extravagant with my exercise my legs just get skinnier and my belly stays nice and pillowy. My breasts also soldier on to the bitter end while my face goes gaunt. My normal is annoying me. And as I approach my 'ahem' mid forties, my shape is getting harder to manipulate with normal careful eating and moderate exercise. I think it's time for DRASTIC ACTION. And the answer is: 5:2. Allegedly staves off Alzheimer's. There's a fair bit of that in my family so I wouldn't mind taking evasive action. I contemplated starting yesterday but the call of my Sustain with yoghurt and avocado toast was just too much. Also I forgot, which brings me back to Alzheimer's. I really need to get a grip. Two days a week? It's not so bad. I'm definitely going to do it. Maybe I'll start tomorrow. Anyone done it? Your thoughts? Five signs I’m turning into a Granny.